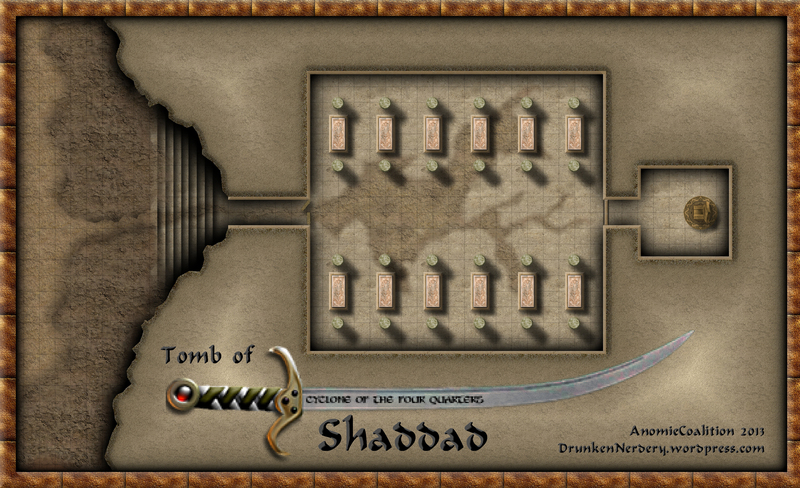 This is a reproduction of a map for the Al-Qadim adventure/encounter “The Genie’s Terror” from the City of Bones sourcebook. The basic story is that the PCs are walking along a wadi (dry desert river basin) when a storm comes (sudden storms in the desert often lead to flash floods which temporarily fill the wadis). The storm has washed away some mud in a nearby cliff face to expose a set of steps descending into the earth. 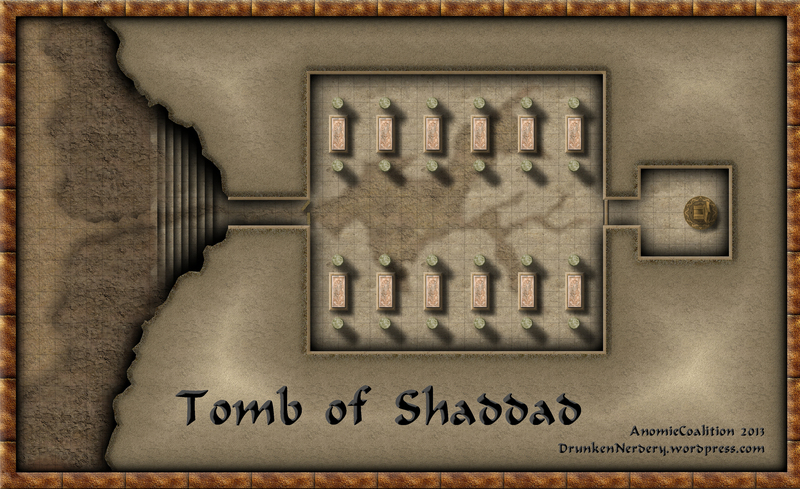 They will soon discover that this is the tomb of a powerful Shi’ar and a dozen shadows. The map is made with CC3 and utilizes textures from CGtextures.com and several objects from the Dunjinni forums. and…due to popular demand from the Profantasy forum…here’s the version with a Scimitar (modified from version found on the Dunjinni forums) incorporated into the title. The “Cyclone of the Four Quarters” is the name of the magical scimitar utilized by an ancient Sha’ir buried within the tomb. Obtaining it is the real prize of this encounter. Categories: Al-Qadim | Tags: Al-Qadim, CC3, Desert | Permalink.